The “Green New Deal” is not shaping up to be what some progressives hoped for. A draft of the plan doesn’t explicitly include a ban on fossil fuels, a must for some environmentalists. Critics and some supporters see this as backpedaling in the face of political and economic realities. Democratic New York Rep. Alexandria Ocasio-Cortez’s “Green New Deal” bill is not quite shaping up to be what some progressives had hoped, and some say the sweeping proposal is bowing to political and economic realities. Ocasio-Cortez’s “Green New Deal” to fight global warming has gained popularity among Democrats and seems poised to become a centerpiece of their 2020 campaign against President Donald Trump. But upcoming “Green New Deal” legislation won’t include an explicit ban on fossil fuels, which was on the wish list of many environmentalists, and some see it as walking back from what the proposal initially promised. Others say the initial goal of 100 percent renewable energy wasn’t very feasible to begin with. “The idea we’re going to have by 2050 … a 100 percent renewable system is not realistic, straightforwardly, certainly at a reasonable cost,” former Energy Secretary Ernest Moniz told E&E News in an interview Wednesday. “It doesn’t violate the laws of physics to do it. But that doesn’t mean it is politically or economically implementable, and I think that is the issue,” Moniz said of the “Green New Deal’s” initial renewable energy goal. Some “Green New Deal” supporters see the omission of an explicit ban on fossil fuels as backpedaling to build more political support among moderates. Some environmentalists see this as a flawed strategy. “Our climate crisis requires that we stand up to the fossil fuel industry and ramp down our fossil fuel production, not allow it to continue its planned expansion,” David Turnbull, spokesman for Oil Change International, told Bloomberg. “Any comprehensive approach to the climate crisis must include a plan to manage the decline of fossil fuel production and ensure a just transition for workers and communities,” Turnbull said. Bloomberg obtained a draft copy of the “Green New Deal” resolution being worked on by staffers with Ocasio-Cortez and Democratic Massachusetts Sen. Ed Markey. At least nine Democrats have co-sponsored the House version of the bill. 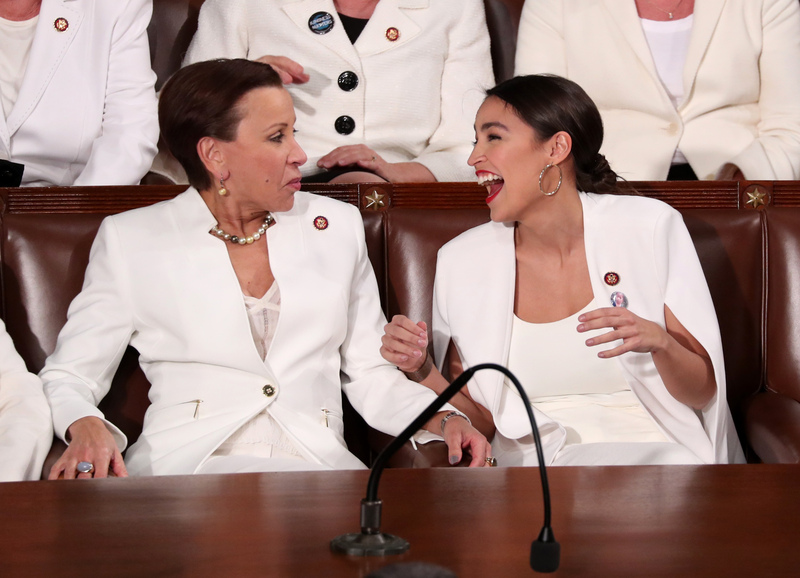 Green New Deal critics say the omission of a fossil fuel ban as an admission that moving the U.S. to 100 percent renewable energy within 10 years is politically and technologically infeasible. 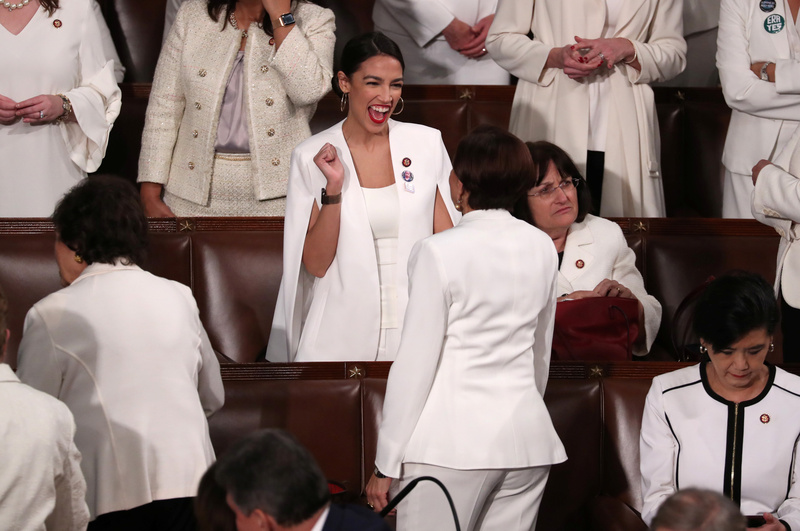 Rep. Alexandria Ocasio-Cortez (D-NY) talks with a colleague as they await U.S. President Donald Trump’s second State of the Union address to a joint session of the U.S. Congress in the House Chamber of the U.S. Capitol on Capitol Hill in Washington, U.S. February 5, 2019. REUTERS/Jonathan Ernst. “It’s easy to declare the end of fossil fuels, but actually crafting a plan to destroy the economy is both bad policy and bad politics,” said Texans for Natural Gas spokesman Steve Everley. “We eagerly await the next walk-back from supporters of the Green New Deal,” Everley said. “We have a $20 trillion economy that rests on an energy foundation that’s been developed over a century. It doesn’t go away overnight,” IHS’s Yergin told E&E News. The “Green New Deal” resolution now calls for “clean, renewable and zero emission energy sources,” omitting specific language to ban fossil fuels, according to a draft obtained by Bloomberg. The five-page draft non-binding resolution also calls for “Green New Deal Projects,” which includes “a dramatic expansion of renewable energy, energy and water efficiency upgrades for all U.S. buildings, and an overhaul of the country’s transportation system to eliminate pollution and emissions from the sector ‘as much as technologically feasible,'” Bloomberg reported. This is a bit misleading. The resolution describes the 10-year plan to transform every sector of our economy to remove GHH and pollution. It says it does this through huge investment in renewables at WW2 scale (which was 40-60% GDP investments). We don’t know if in 10 years we can totally eliminate eg air travel and cows. But we think we can ramp up renewable power production, retrofit every building in America, build the smart grid, overhaul transportation/ag, plant trees, restore our ecosystem, etc to get to net-zero. “Accounting for the true cost of emissions” and more government spending will be required, the document says, suggesting taxes on greenhouse gas emissions could be part of the equation. The resolution does not specify how a “Green New Deal” would be paid for.